It all started with a Medium post. Quartz Composer, long rumored to be a favorite tool of Mike Matas' to prototype UIs in, got some quick time in the spotlight when it was mentioned as an essential tool for concepting out Facebook Home. This mention, while pretty casual in the article, actually sparked a lot of interest in Quartz Composer as an interaction design tool. The problem was, there are almost no resources out there to help you get started, and Quartz Composer is notoriously difficult to get started with. Luckily, Dave O'Brien took it upon himself to rectify the situation. In a serious of wonderful tutorial videos, he walks through the process of how he would make a Facebook Home prototype in QC, and teaches you the basics of how the program works along the way. Finally, amidst a sea of un-information regarding Quartz Composer, Dave gave us our small remote island paradise. If you're truly interested in learning how QC works and how it can be used for interactions, I highly suggest watching all 10 videos in his Facebook Home series from start to finish. Being the masochist that I am, I decided to take on learning Quartz Composer myself, and Dave's videos were indispensible. However, I also picked up some key insights along the way in addition to everything in the videos, and I figured it would be helpful to share those to try to fill in the gap of knowledge that exists online regarding Quartz Composer. This isn't meant to be an exhaustive overview for learning QC, for that make sure to watch Dave's videos. But if those videos left you thirsty for more, read on. One of the first challenges I ran into almost immediately after throwing together my first few patches was QC's native units system. By default, QC doesn't know about pixels: everything is relative to a cartesian coordinate system that goes from -1 to 1 on both the X and Y axes. This is great if you're making VJ visualizations that need to be rendered at arbitrary sizes, but it plays hell with pixel compositions you might be getting out of Photoshop. With a bit of elbow grease you can force QC to recognize pixel units and render everything at its native size, but it comes with a bit of complexity and a couple pitfalls you need to be aware of which we'll get to in a bit. 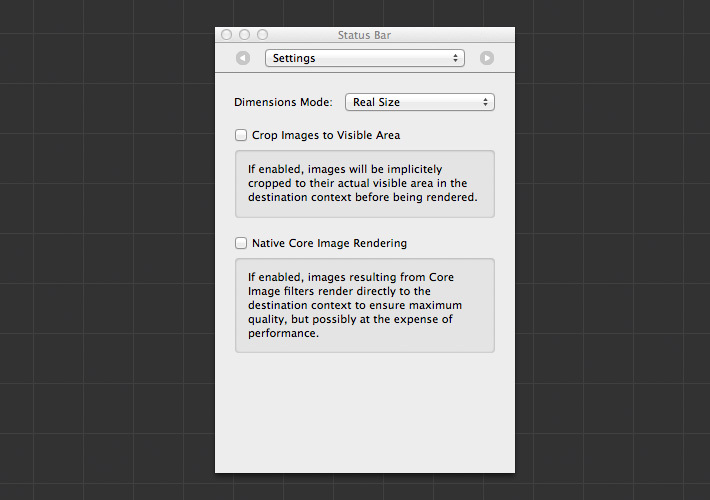 If you're using a Billboard1 to render out your image, bring up the Settings Inspector for it (⌘+2) and select "Real Size" for the Dimensions mode. You should now see your image rendered at its actual pixel dimensions within your composition. However, if you try to change its X and Y values, you'll notice it still takes values in Units, between -1 and 1. What we need to do is take pixel values and convert them to units, and luckily there's a patch for that called Pixels to Units (as well as its opposite, Units to Pixels). Add this patch to your document and connect its Output to the X Input of your Billboard, and then do the same for Y. Now, if you set a pixel value on the Pixels to Units patch, you'll see that this value is converted to QC's native units and applied to the Billboard. Success! However, as I mentioned before, there are a few pitfalls you need to be aware of and avoid. There is no global conversion to pixels for your composition, you have to do it yourself everywhere you need it, which means you need to keep track of when you're setting things in pixels and when you're setting things in units. By default, unless you're running something through the Pixels to Units patch, everything in QC expects units. 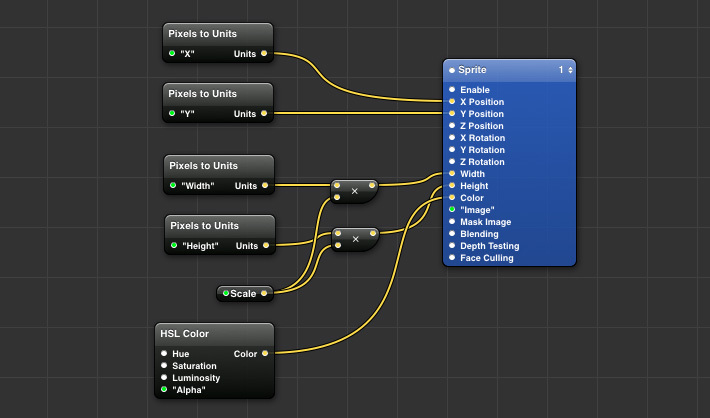 So, if you're doing a calculation on a pixel value in another patch, remember to convert it back to a Unit before connecting it to another patche's Input that expects units, such as X, Y, Width, or Height in a Billboard or Sprite. It's best to think about the Pixels to Units patch as a convenience for yourself as a creator, and to just always convert everything back to units once you actually interact with other QC patches. If by now you're thinking it's going to be really annoying to constantly convert pixels to units every time you want to move a Billboard or Sprite around the screen, then you're absolutely right. That's why, whenever possible, you should use a concept well-known by programmers: DRY, Don't Repeat Yourself. One of the easiest ways to do this is to build yourself a macro patch that handles a common situation you'll be running into a lot. For example, here's a macro patch I made called Pixel Sprite, which takes some common properties I use a lot and exposes them for easy use. For this macro patch, I've gone ahead and exposed the Inputs for X, Y, Width, and Height in pixels, as well as Alpha and a custom Scale calculation. What's nice about this is now I can expose those properties both through the Input Parameters pane and as Inputs to be modified, as you can see below. Just remember the caveats from above: your macro patch is expecting values in pixels for X, Y, Width, and Height, so make sure to use that Units to Pixels patch if the output you're getting from another patch is in units (which it would be by default). Put all of this together, and you can combine the functionality of 10 different patches all in one code block of logic, and with things like code comments, have it be 100 times clearer. If you have a few elements that you want to move as a group, such as a grid of thumbnails where each thumb is its own Billboard, then the 3D Transformation patch is for you. Simply add it to your composition, grab all of patches together you want being transformed as a single unit, and place them into the 3D Transformation patch. Now, when you act upon the X and Y of the 3D Transformation (remember, by default this is in units, not pixels!!! ), it'll move all of the elements inside it together. And, if you expose some extra Inputs from inside the patch, you can even act upon both the 3D Transformation and each sub-patch's X and Y values at the same time, giving you some interesting results. 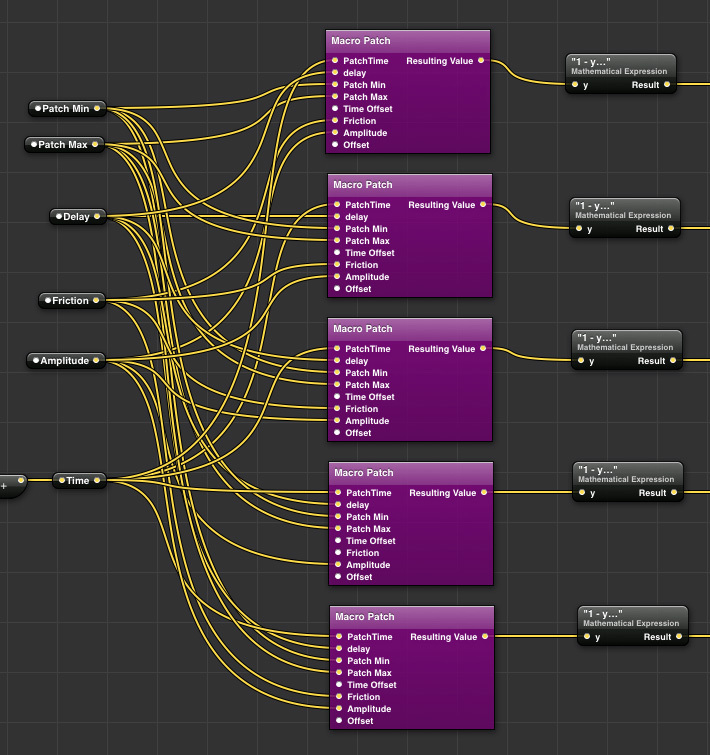 As you can see, each of the purple patches take a value as an Input. For a lot of those values, they all need to be the same. 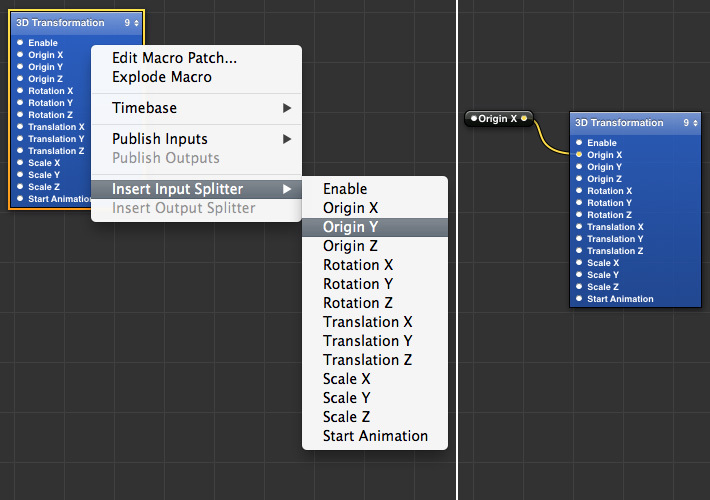 Instead of clicking on each individual macro patch every time I want to change something like Amplitude, Friction, or Time, I've instead added an Input Splitter, connected it to each macro patch, and now I have one place where I can change the value of that for all of the macro patches at once. Just make sure to go into the Settings Inspector for the splitter (⌘+2) and change the Type from Virtual to whatever type you need (in my example, it would be Number). You can also create an Input Splitter from a pre-existing Input by right-clicking on a patch, selecting Insert Input Splitter, and choosing the Input to split. This also works the same for Outputs. 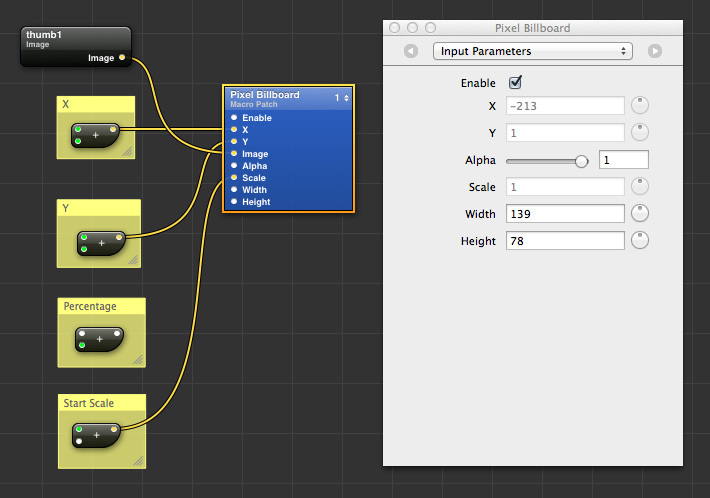 Hopefully that's enough to get you started and thinking in the Quartz Composer way. If you had any other questions, feel free to reach out to me on Twitter or App.net, or even better join QC Designers and post your questions there. Good luck!